Last Tuesday, April 26, the 101 years of Armenian Genocide was remembered by the Legislative House of São Paulo by the initiative of the city councilman Gilberto Natalini and the Armenian Nacional Council of Brazil (CNA – Brazil). The act was realized in the Great Hall of the Anchieta Palace and counted with the presence of important representatives of the civil community in general. among the presents stood out the city councilman Ari Friedenbach and Jamil Murad, the General Consul of the Russian Federation Konstantin Kamene, besides the ex-senator and ex-secretary municipal of Human Rights Eduardo Matarazzo Suplicy. The act had the participation of the band of the ONG Casa dos Curumins, an important entity of support to the young people who intoned the Brazilian and Armenian Anthem honored the struggle of Armenian people and thrilling the audience (watch below). The participation of The Armenian club`s choir SAMA, Vahakn Minassian , conducted by the master Alexey Kurkdjian, fostered the rich culture of Armenia representing the struggle of preservation of the identity and the resistance of Armenians even after the genocide. Once again the rap group Crônica, which composed and recorded the song “A Causa Armênia” to publicize the question of Genocide at the centenary year in partnership with CNA – Brazil, brought their voice of protest fighting for the recognition of Armenian Genocide and was honored by Natalini and CNA. 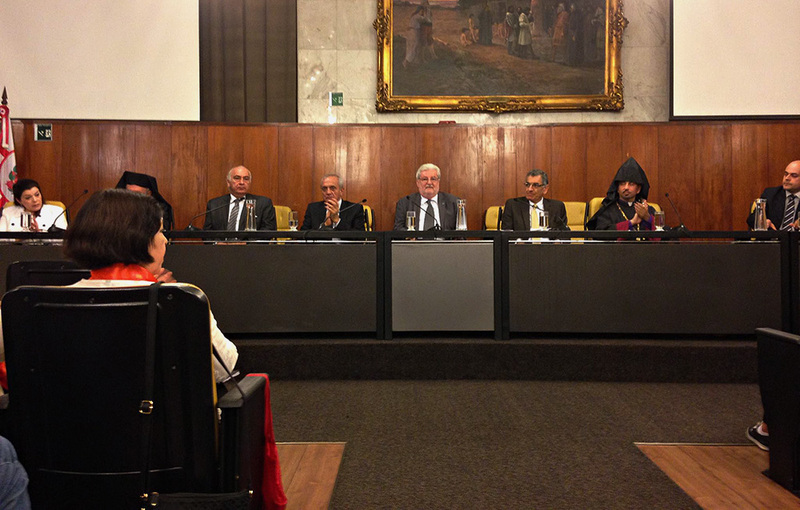 The table of honour was composed of Mr. Achot Galoyan – Embassador of The Armenian Republic in Brazil -, The Bishop Nareg Berberian – Primate Titular of Armenian Apostolic Church of Brazil-, Bishop D. Vartan Boghossian – Armenian Catholic Exarch of Latin America – Kevork Zadikian, President of CNA-Brazil, Anahid Rizian Bogiatzian – Representant of CNA – South America, Dr. Everton Zadikian – representing the president of the Order of Lawyers of Brazil, beyond of the Grand Master Alexandre Hamparian – representing the Great Orient Brazil. In his words, the Embassador Galoyan stressed the importance of acts of unity to strengthen the struggle of Armenians Everywhere. The Embassador emphasized that The Armenian nation, diáspora, and the Armenian Republic are ready to collaborate towards a prosperous and peaceful future. On behalf of the F.R.A – The Armenian Revolutionary Federation – Tashnagtsutiun, Professor James Onnig Tamdjian reminded that the tragedy and injustice continue with the attacks of Armenians in Syria and the violence , which started by the Azerbaijan government against the Armenian people in Nagorno Karabakh. At the closing ceremony, the city councilman Natalini reminded that he was a political prisoner, tortured by the Brasilian dictatorship and never forgot his commitment to the true causes like the Armenian Cause and promoting the culture of peace (see below).